The purpose of the Records Management Framework is to contextualise Records Management within the University setting and within the broader legislative, regulatory, standard, best practice and community environments. The framework is an organising framework that provides guidance to University staff on the key Records Management documents (policies, standards, tools). It will also provide a basis for the University to identify and prioritise additional recordkeeping artefacts and improvement activities to address identified gaps. Records provide evidence of business activity and transactions, that is, what the University has (and hasn’t) done. Like the University’s other key resources (staff, finance, infrastructure and intellectual property) records are critical for the University to conduct business now and in the future. Knowledge and information are at the core of the University’s business and JCU has a duty to treat the information it collects and produces as an essential, valuable and authoritative resource and to effectively manage our knowledge resources and corporate memory. Having and maintaining a properly managed system and set of practices for University records provides confidence to the University’s stakeholders’ that the University’s records are treated as a core business resource that will support the ongoing achievement of our strategic objectives, the delivery of services to our clients, protect our rights and enrich the historical resources of the community. preservation of the University’s corporate memory and cultural collections to enrich the community. The University has developed and will continue to develop and review a framework for managing and using its records and corporate information in order to achieve the above. Right to Information Act 2009 – this Act promotes greater openness and accountability by giving individuals a right to apply for access to documents held by agencies and requires agencies to publish a publication scheme on its website which includes an online disclosure log of documents that have been released in response to Right to Information applications. This Act requires that full and accurate records be effectively managed to ensure that they are available in a useable and timely manner should access be approved. Information Privacy Act 2009 - the object of this Act is to govern access to and amendment of an individual’s personal information and provides legislative safeguards regarding the handling of personal information. 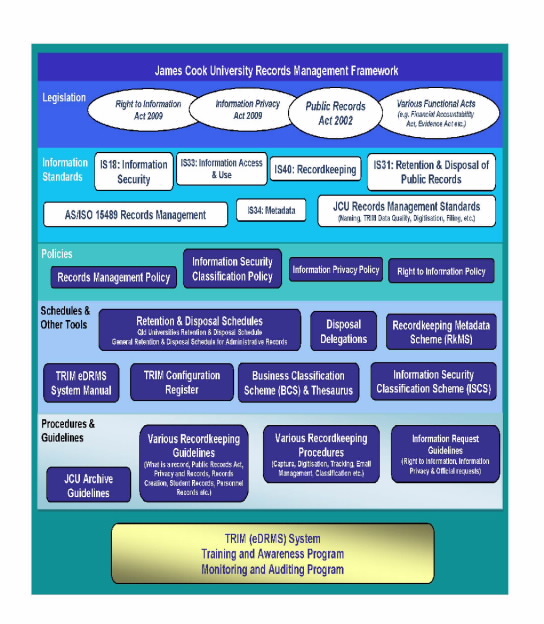 From a records management perspective this Act, like the Right to Information Act requires that full and accurate records be effectively managed to ensure that they are available in a useable and timely manner should access be approved but it also specifies the number of the controls required to protect and safeguard personal information held by the University. Evidence Act 1977 – amongst other provisions this Act specifies the conditions to be met to allow the admission of records and documents as evidence in legal proceedings. Financial Accountability Act 2009 – this Act requires that all public money and public property, including records and other information assets, be appropriately administered. This legislation assigns responsibility for records management to the Chief Executive Officer, JCU’s Vice Chancellor, who in turn has delegated this responsibility to all officers, employees and other persons acting in their official capacity for or on behalf of the University. Standards are measurable and can be subject to audit to determine the level of compliance or may set a benchmark within a sector. There are three main types of standards. Information Standards (IS) are issued under the authority of legislation and promote best practice in the management of information, information systems and technology which support business processes and service delivery. They provide strategic level principles on which the policies, guides and other tools are based. Some of the principles in these standards are mandated and therefore place a compliance obligation on the University. IS18: Information Security – this standard focuses on establishing a set of principles to protect the confidentiality, integrity and availability of information through appropriate physical, electronic and human security controls. IS31: Retention and Disposal of Public Records – this standard sets out the rules under which the disposal of records may occur. The term 'disposal' includes: keeping all or part of a record for a period of time; destroying, deleting or migrating a record or part of a record, and abandoning, transferring, donating or selling a record or part of a record. There are significant fines that can be imposed for unauthorised disposal of records. Principle 7 – Full and accurate records must be made and kept for as long as they are required for business, legislative, accountability and cultural purposes. AS/ISO 15489-1:2001Information and documentation – Records Management Part 1 and 2 – this standard sets out the principles, processes and practices associated with records management and sets out accepted good practice within the industry. These standards are under development and will specify the standard or benchmark to be followed by staff in performing certain records management activities such as file naming, email naming, TRIM data quality etc. A policy is a statement that specifies non-discretionary governing principles and intentions which articulate required University practice to meet the organisation’s guiding principles and legislative requirements. University policies must comply with all relevant legislative and statutory requirements and must be approved by the appropriate University authority. Queensland Universities Retention and Disposal Schedule – this schedule covers a range of functions common to Queensland Universities including records of University Council or Senate, Chancellor, Vice-Chancellor, Student, Research, Teaching and Learning, Health Services, Student Services, Faculty, School, Department, Bookshop, Library, Museum, Child Care Services, Food Services, commercial activities and Art Gallery records. General Retention and Disposal Schedule for Administrative Records – unlike the Universities Schedule this schedule coves a range of administrative functions that all public authorities perform including financial management, human resource management, facilities management, corporate governance etc. Business Classification Scheme (BCS) – a business classification scheme is a hierarchical taxonomy or index that describes the records in relation to their function, activity, transaction and/or subject. It helps describe the records so that they can be found (similar to keywords in an internet search engine) and places records together that are related because of their subject matter or context within the organisation. Records Management Security Classification Scheme (RMSCS) – this scheme sets out different security classifications for records so that it is protected from unauthorised access, use or disclosure. Recordkeeping Metadata Scheme – this scheme sets out the metadata that will be captured within the records management system. Amongst other things the scheme identifies the metadata tags, allowed metadata values and any conditions on the use of the metadata. Delegations – these authorise particular staff to perform certain activities. For example, under the Public Records Act the Vice-Chancellor is responsible for all records disposals however Records Disposal Delegations authorise other staff to approve the disposal of records. Guidelines* and Procedures* are designed to assist the University and its staff in meeting their recordkeeping obligations and to foster good practice. Every employee of the University is required to manage records and corporate information that they are responsible for and are subject to legislation relating to records management. All staff are accountable for the management of documents and records (including electronic records) generated in the course of their duties or under their direct control. All University records should be appropriately stored and properly secured to prevent unauthorised access, disclosure, modification, loss or damage. The Vice-Chancellor and President, as Chief Executive, has overall responsibility for ensuring that the University complies with the legislative requirements. The Director, Governance and University Secretary as Compliance Officer is responsible for ensuring that the University has an adequate and appropriate record and corporate information framework, which is adhered to. Continual improvement of records management practices across the University. Corporate Information and E-Records Section, JCU, Townsville Qld 4811.